On Monday, I shared a casual 4th of July outfit, but I also wanted to share something a bit more sophisticated and semi-dressy. I know not all 4th of July parties are cutoff shorts appropriate. When I think classy holiday look, I immediately gravitate towards navy and white. 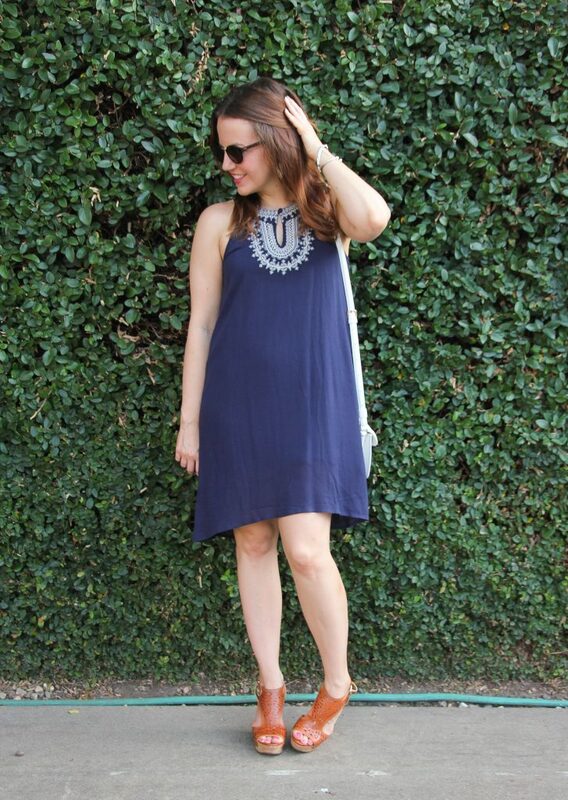 This navy dress is that perfect semi-dressy and festive piece. I love the halter neckline. I like being able to show off a little shoulder, and I think the cut is flattering on multiple body types. The white embroidered details add a great feminine touch to the dress too. I always want to make sure I’m not going to be hot, and this dress is very lightweight. It’s also lined so no extra slip needed. I decided to pair this dress with white accessories to really help the embroidered detail pop. You could also pair with some red accessories like these shoes and these earrings to make this look a bit more festive. I opted for wedges because I feel like many holiday parties take place outdoors and on grass. Wedges are much easier for walking through grass, and they still can make an outfit look dressy. I hope one of these looks has helped inspire your holiday outfit. Since the 4th of July is still a week and half away, pin your favorite look so you don’t forget it!! Hope ya’ll have a great day! I have this almost exact same dress except it’s from Max Studio last year. It was one of my favorites for spring/summer 2015 and I even wore it yesterday!! 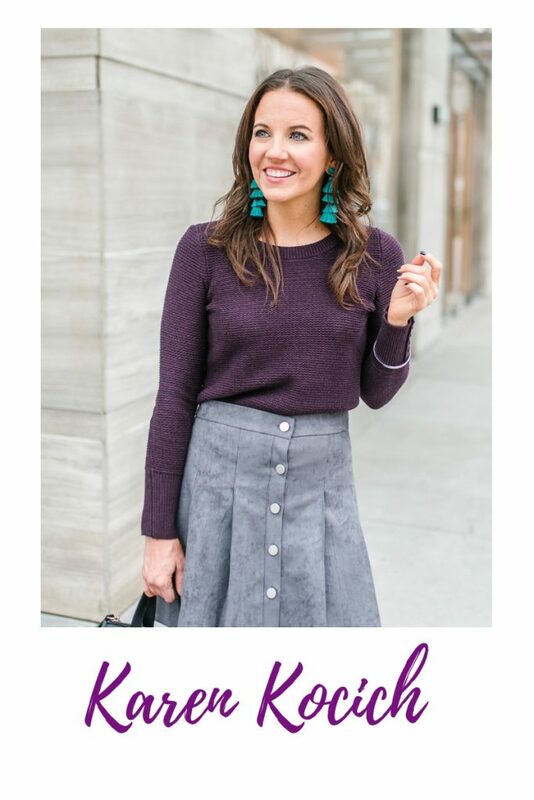 Great style and easy to wear. I was also planning to wear it on July 4th!! This is a very classy 4th of July look! Navy + white is always a great combo! Karen that dress is very pretty and you make it look great! I love summer dresses! Thank so much!! Your too sweet! Love your dress, I love dresses that requires no additional jewelry. Thanks! Yes I love dresses with gorgeous neckline details! Your dress is so cute and one that can be dressed up or down. I love dresses and wear them a lot in the summer because I think they are cooler than pants or shorts. 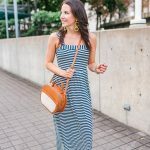 Yes, dresses are one of my favorite things for summer! They work so well with the heat! I love that dress! The white detailing is beautiful and perfect for the 4th! So pretty. LOVE this look! Love the details on this dress. You look great in this! It is a classy dress and I love the detailing on it! This is a cute Fourth of July look for a nice dinner party! YES! That’s exactly the kind of occasion I had in mind! Great dress! Perfect for the 4th! Beautiful! I love this look. Such a perfect outfit for the 4th, thanks for sharing!